(mens M) Crazy Ugly Xmas Sweater, BIG Xmas Tree, Teddy in a Plaid Bow! Home > Ugly Christmas Sweaters > mens MED Ugly Christmas Sweaters > (mens M) Crazy Ugly Xmas Sweater, BIG Xmas Tree, Teddy in a Plaid Bow! 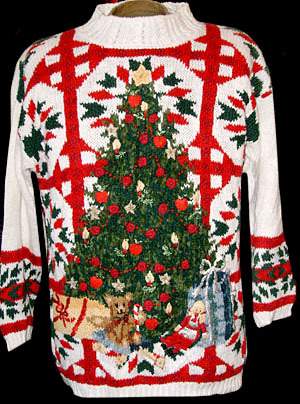 Fantastically Ugly Christmas Pullover Sweater! White knit with Red Line-Arrows design and a BIG Xmas Tree in the middle with Gold Stars, Cranberries, Apples, Candles, and a pile of presents at the bottom with a happy lookin teddy wearing a plaid bow. Cool red and green pinwheel designs are in the red arrow-line grid-things. Green Snowflakes and Red lines at the end of the sleeves. Back is Solid. High, Turtle-Necky Collar. Super Gaudy Delicious! Tagged by Heirloom Collectables. Ramie/Cotton. Condition: Very Good: Has some gaps in the weave from the weight of the sweater. Does not detract from the awesomeness of this sweater! Chest: 40" best for a mens MEDIUM.